Pina Coladas have always been a tropical party drink, always have and probably always will be. So jazzing them up with some fresh fruit just adds a little excitement to this wonderful and refreshing cocktail. Try adding an orange or blueberries. Put the crushed ice in a blender. 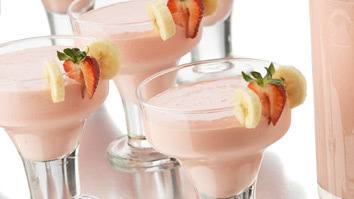 Add the two rums, pineapple juice, whipping and coconut creams, strawberries and sliced bananas. Blend until smooth and creamy. Pour directly into a fancy cocktail glass and garnish with a pineapple wedge and strawberry slice on a toothpick. Serve and Enjoy !